By Daniel Horowitz--It’s been said that adversity breeds true leaders. Certainly that can be said of Fred Waks who, along with Ariella Rohringer, rose to tremendous heights, exhibiting true communal leadership, when Israel came calling for our support and UJA responded by quickly organizing its 2007 Israel Emergency Campaign, which raised more than $60 million. he Foundation, UJA Federation’s endowment and planned giving arm, currently has a total of $500 million in assets and planned gifts. And it’s no secret what Waks sees as his biggest challenge in his newest role. “I want the public to have a broader awareness of the Jewish Foundation, and what we’re doing,” says Waks. “There’s going to be a huge transference of wealth in the next 20 years or so, and the truth is that we have to prepare the next generation to fully understand the options we offer. Unfortunately, many of the challenges facing our community have not changed, but have grown. As long as they continue to grow, we have to make sure that we have the sustainability to keep up with that growth. And the Foundation has an empirical involvement in making that happen. You can build buildings, but you then need to endow and have these buildings sustained. The Jewish Foundation is something that needs to be explained to the myriad of people who do not understand how vital it is to this community.” And when it comes to doing what he can to help the Jews of Toronto, Israel and around the world through the Jewish Foundation, Waks is ready to be shameless. “There are many philanthropic choices available to donors today, with many organizations asking for our money,” explains Waks. Whether it’s through Waks’ role during the 2007 Israel Emergency Campaign, UJA Federation’s Real Estate Top Gifts Division, or chairing Israel @ 60 celebrations, one thing is abundantly clear: his volunteerism is clearly a labour of love. “I’ve always said that the largest single gift one should make, should be to UJA,” he says. 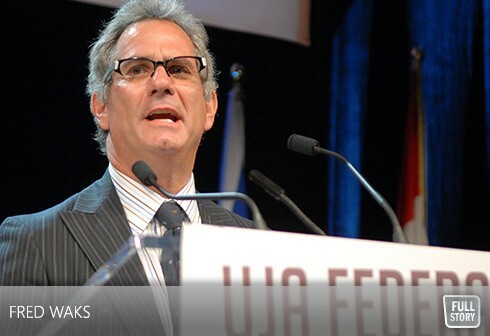 “Fred is a tireless contributor and promoter of the Jewish community here in Toronto as well as Israel,” said Richard Venn, a past chair of the Foundation, and the current Board Chair, UJA Federation. “He has assumed a greater and greater role in fundraising for the Federation as UJA’s Israel Emergency Campaign Chair in 2007, and as the very successful JNF honouree in 2012.